Here is the compete India Vs Australia Schedule. Having endured a long and hectic period on foreign soil, the Indian cricket team is set to get underway with the last stage of preparations for the ICC ODI Cricket World Cup come February 24 when the side will resume one of the oldest and most intense rivalries in the cricketing fraternity. Having travelled successfully to Australia just a month back, the Indian side gears up to entertain the Australian at home for a series across the T20 and ODI formats. The teams will play two T20Is and five ODIs between 24th February and 13th March with the series beginning with the 20 over format. All ODIs will be day/night affairs, starting at 1:30 pm IST, while the T20s will commence at 7 pm IST. The series is set to follow up India’s recent visit of New Zealand which had seen them contest in a highly competitive and feisty ODI and T20 series while the Australian side had played host to Sri Lanka for a two-match test series, which they had managed to sweep away with relative ease 2-0. The ODI series will begin on 2nd March before coming to an end in the capital city at the iconic Feroz Shah Kotla Stadium in Delhi. The team for the T20 series and ODI series is expected to be announced on 15th February as the selectors and team management try to manage the players’ workload and ensure they don’t incur any unwarranted injuries ahead of the all-important world cup. Keeping this in mind, the Indian squad could see Rohit Sharma being rested with Ajinkya Rahane being recalled to the side as the governing cricket council looks to seal its final combination for the England World Cup set to be played starting May 30. Virat Kohli, Jasprit Bumrah and Mohammed Shami are all expected to make their way back into the side after getting a much-needed rest as they came out from a heavily congested and hectic period. Pacer Bhuvneshwar Kumar might be seen given a rest as well after having bowled tirelessly and with equal vigour for the last 3 months in inclement conditions. “Workload management of the senior players will definitely be the main area of discussion as we all know that the Indians have been on the road and the selectors and team management have made a conscious effort to ensure that the players get ample rest between games and series. Like you saw, regular skipper Virat Kohli was rested for the back end of the New Zealand series. You might see Rohit Sharma rested for some games here,” a BCCI official said while speaking about the team selection. “But it is also important to note that the Indians would want to keep the foot on the pedal and ensure that they don’t give the Australians any momentum going into the World Cup. A good series against India would mean a confidence booster for the team. So, there has to be a balance so that the composition of the team is not affected,” he added. The series will be telecasted by Star Sports on Star Sports 1, Hindi/HD in both English and Hindi commentary with the broadcaster already rolling out a maverick advertisement ahead of the series. Using the recent babysitting incident between Pant and Paine, the channel has reeled in Virender Sehwag who’ll be making a highly awaited return as a commentator with a hilarious spin on the incident, one that takes a jibe at the Australians for indulging in the petty and needless comments during the test match series which they eventually went onto lose 2-1. 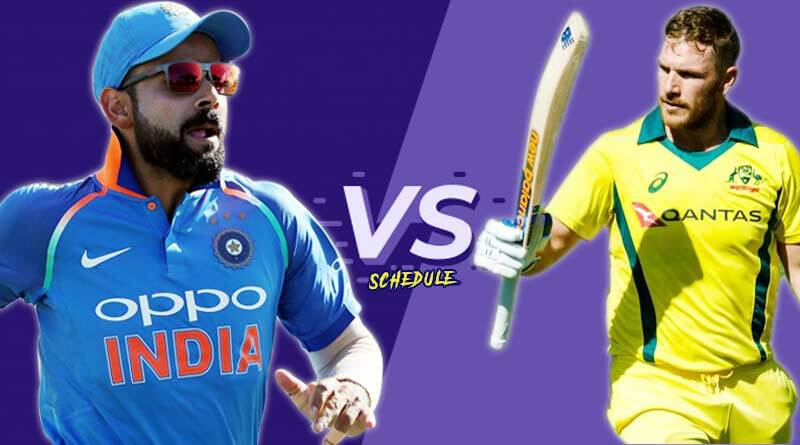 For more articles like India Vs Australia Schedule, do Subscribe to our newsletter and follow us on Facebook, Twitter and Google+.